There are great paintings in the Roy Lichtenstein exhibition that opened this week at the Art Institute of Chicago. There are iconic paintings, too, and lots of overlap between those two categories. 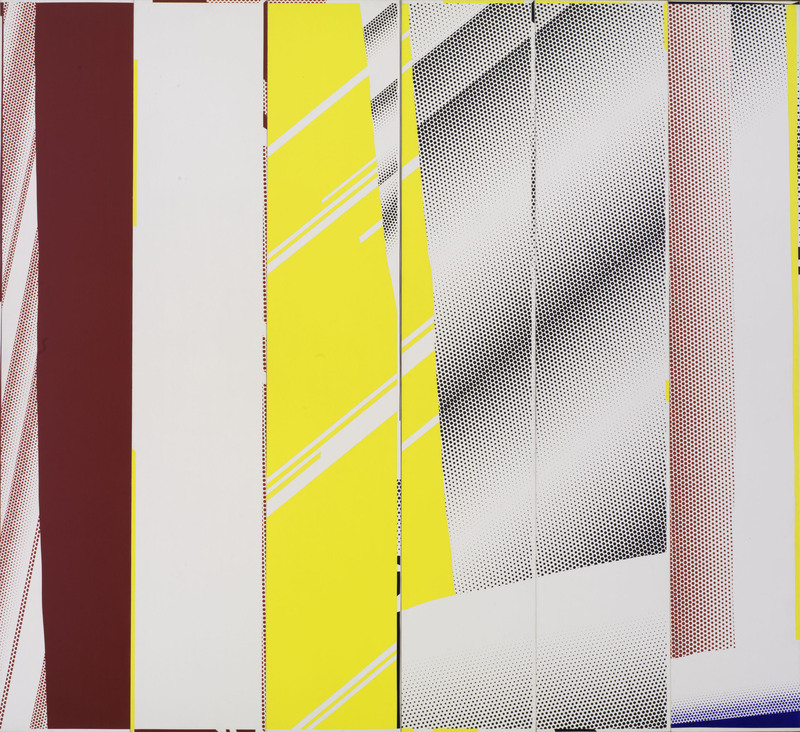 The time is right for a retrospective of work by the famous American Pop artist: Among countless other examples, Lichtenstein’s continued influence appears in new paintings by Anna Elise Johnson, on display May 9–12 at the University of Chicago’s new Logan Center for the Arts. Anna Elise Johnson, Camp David, November 15, 1986, Reagan / Thatcher, 2011. Oil on canvas. Image courtesy of the artist. 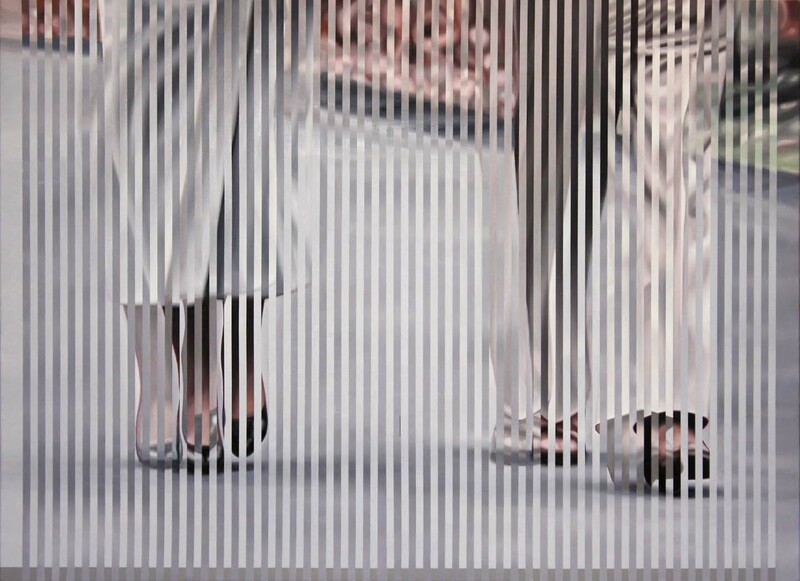 Gerhard Richter, more than Lichtenstein, was on Johnson’s mind while she painted deinterlaced, close crops of political speeches and summits between 1981 and 2011. But “a lot of people brought up Lichtenstein in my critiques,” Johnson tells me by phone, and there’s no doubt that her rendering of Margaret Thatcher and Ronald Reagan’s legs at Camp David, for example, has much in common with Lichtenstein’s black-and-white portrait of a car tire. “One can almost smell the rubber in this picture,” says exhibition cocurator James Rondeau of Tire (1962) during the audio guide for “Roy Lichtenstein: A Retrospective.” Likewise, one can almost hear Thatcher and Reagan’s shoes hitting the pavement in Johnson’s Camp David, November 15, 1986, Reagan / Thatcher (2011). Faced with either painting, however, one is also confronted with a multitude of questions about representation, contemporary culture and painting itself. Lichtenstein’s Tire is about tires and yet, at the same time, isn’t at all. Johnson’s bifocal close-ups — she takes two slightly different points of view on the same scene, cuts them into narrow strips, then shuffles them together like playing cards — are and aren’t about political leaders or, in the case of Moscow, March 15, 2011, Blankfein / Medvedev (2011), titans of finance. The Art Institute currently holds more than 160 Lichtenstein works, which museum Ditmer chair and contemporary curator Rondeau, with Sheena Wagstaff of New York’s Metropolitan Museum of Art, culled over five years spent looking at thousands of drawings, completed paintings, sculptures and reproductions. Their show’s hall of mirrors is, for me, the chief reason to see it. Roy Lichtenstein, Mirror in Six Panels, 1971. Oil and Magna on canvas. Image courtesy of the Art Institute of Chicago. Seven “mirrors” hang in their own room, at eye level for most adults. From a series of nearly 50 mirror-related paintings Lichtenstein created between ’69 and ’72, this subset, given their own space and the fact that some of them face one another, is a kind of installation within the exhibition. The dramatically enlarged, isolated panels from comic strips are out of sight from most angles. Ditto workaday objects as portrayed in ’60s advertisements, and the painter’s late-career nudes and “Chinese” landscapes. “He’s not so much interested here in mirror-as-object,” says Rondeau for the guide, “although that certainly is a part of the fascination.” The mirror paintings are, he continues, “vehicles [for Lichtenstein] to examine, and to understand, what the graphic codes that signify reflection are.” Paintings themselves are, of course, reflections of their creator’s views onto the world. And Lichtenstein’s looking-glasses continue a tradition of mirrors in painting that includes, to name one example, Las Meninas (1656) by Diego Velázquez. Representations of usually reflective objects, on the cusp of painting and sculpture, facing each other in an otherwise empty room, reflecting nothing except concepts grappled with throughout centuries of art history: This is the genius of the hall of mirrors in “Roy Lichtenstein: A Retrospective.” It’s a room of ideas in line with what Rondeau and Wagstaff told press on May 11 were their goals for the exhibition: to begin a new trajectory rather than present closure, and to offer viewers questions, not answers. “Roy Lichtenstein: A Retrospective” is on display through September 3 at the Art Institute of Chicago.